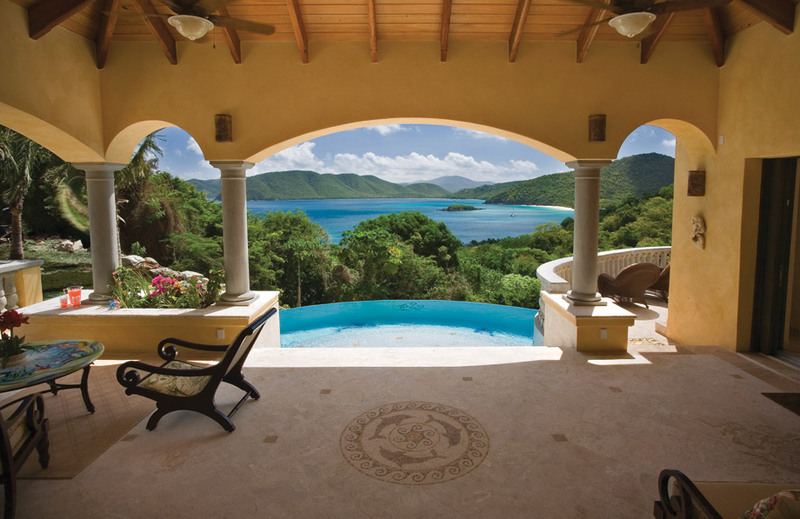 St. John is known for its beaches and a large collection of luxury villas dotting verdant mountainsides. From St. Thomas, you can take the ferry to this smaller and laid-back sister U.S. Virgin Island of St. John... an island 20-40 minutes away in time but light years away in ambience. This popular Caribbean island has only two major hotels, but offers hundreds of St. John luxury villas and vacation properties, from basic rental cottages and condominiums, to super-luxurious villa estates. McLaughlin Anderson Luxury Villas has a wonderful portfolio of luxury St. John villas and condos - be sure to book yours early, as this is one of the most sought-after vacation destinations in the Caribbean. Spend some time poking around the many interesting and artsy shops that line the streets of Cruz Bay, St. John's main hub. Don't miss shopping in Wharfside Village and Mongoose Junction, St. John's beautiful island-style malls, plus many other varied shops and galleries. Cruz Bay can be lively at night too, offering some excellent restaurants and watering holes from casual to very upscale, and live music and dancing. Take a drive via scenic roads out to Coral Bay, a small village where you'll enjoy funky bars, a few quaint shops and horseback riding. You can continue eastward to St. John's pristine east end for its spectacular views and crystal-clear waters: Coral Bay, Hansen Bay and Privateer Bay beyond play host to incredible sunrises and unspoiled nature. And of course, on St. John, watersports abound: SCUBA diving, snorkeling, sailing, power boating, beach lounging and swimming. 5,000 acres of St. John are designated as Virgin Islands National Park (courtesy of the late philanthropist Laurence Rockefeller). National Park lands occupy a full three-fifths of this 9-by-5-mile Caribbean island, keeping it relatively tranquil and pristine. With over 20 hiking trails, miles of fabulous beaches, and with easy access to the British Virgin Islands via ferry, St. John is the ideal place for vacationers seeking the fable and aura of seafaring explorers, pirates and undersea life. Explore the stunning National Park beaches of Hawksnest Bay, Trunk Bay, Cinnamon Bay and Maho Bay and their sugar-white sands and clear, shimmering blue waters before retiring to your villa for the night. The Virgin Islands National Park's Rangers offer hikes, seashore walks, historic, cultural and snorkeling tours, bird watching and informal evening lectures to visitors. Leaving the town area means ascending high into St. John's hills; Bordeaux Mountain offers a cool bird's-eye view of the British Virgins Islands, plus a portion of the famous Reef Bay Trail, to the Reef Bay Estate Great House. There are other historical monuments to explore, including the Windberg Estate, the Frederikdal ruins, and the restored Annaberg Plantation (a National Park site). For a very small island, St. John offers lots of action-packed, fun days and nights for the young at heart. But should you want to sit quietly by your villa's private pool and simply relax with your loved ones, this is also the perfect place to be. St. John (the island) and St. John's vacation villas truly have it all. BRING PROOF of YOUR CITIZENSHIP Everyone departing St. John, even Americans, are now required by U.S. Immigration to show either a passport or a certified copy of a birth certificate accompanied by a photo ID - please don't forget these for the whole family! Immigration - No passports required of U.S. Citizens (bring certified copy of birth certificate; add gov't photo ID for adults). Day and other trips to BVI require passport or passport card (sea only) for re-entry; visas may be required from other destinations. Consult your national immigration office. Many adjectives have been used to describe St. John: "bucolic", "sleepy", "low-key"... this lush U.S. Virgin Island is two-thirds National Park, adding to its tropical allure. St. John villa guests have access to many modern conveniences, such as internet connections, island wedding planners, and transportation assistance. We highly recommend that you pre-stock (provision) your villa so that you can get down to the serious business of relaxing following what's generally a long travel day, especially if you have children on hand or you have special dietary needs. This service will be invaluable, freeing you up to be embraced by your luxury villa's fine appointments and verdant surroundings. Hire a professional chef for your St. John villa stay; you'll love the convenience! Our chefs are specially selected for their reputations, service and varied menus. Consider hosting a meal for a special occasion, or just to pamper your sweetheart or loved ones. Throw off the cares of day-to-day living and really kick back in style. Special dietary needs, grocery starter packages, celebration cakes and gift baskets are all specialties! Please contact our Concierge on confirming your order so that villa staff may allow access for the delivery of your order! Experience an invigorating massage or other spa services on St. John! Escape to calming body wraps, sports massage, or aromatherapy to help soothe mind, body and soul. Please contact us for more information on this special service. Advance reservations highly recommended. Sweet St. John is just one of the tropical island jewels at your disposal for seagoing fun. Below the surface is a teeming metropolis of ocean life. Enchanting sea fans and stunning coral provide a backdrop to all manner of fishes and shellfish going about their daily lives between here and British Virgin Islands such as Virgin Gorda, Norman Island and Jost Van Dyke. Dolphins may eye you with amusement, a sea turtle may paddle by on the way to lunch... under such intense observation, you just may wonder if you're the exhibit! You've become a part of the oceanscape, and in the company of expert divers and captains, you will experience the full range of activities above and below the water from beautiful St. John. We know that your St. John villa is why you came, but why stay in when you can get out and discover the islands? For good, old-fashioned fun, there's no place like St. John! The island vibe reigns with plenty to do and see that's exotic and new. On the other hand, you can also take a day trip to sister island St. Thomas or visit the British Virgin Islands for a spree that will stimulate your senses. Bring your camera, your sunscreen, and your smile! Internet Cafes - Surf da Web St. John Marketplace, 2nd floor. St. John Wedding & Photography Services assistance: Ceremonies of St. John - www.usviwedding.com.